Create an oasis for you to start your next project with the TreasureChest PlusIV. Discover the height, storage and creative space you need to be organised. Enjoy 3 large drawers for incredible storage, plus space for a Madeira TreasureChest. Keep your supplies on hand with the luxury of a built-in notions palette. The TreasureChest is the perfect height to work comfortably while sitting or standing. 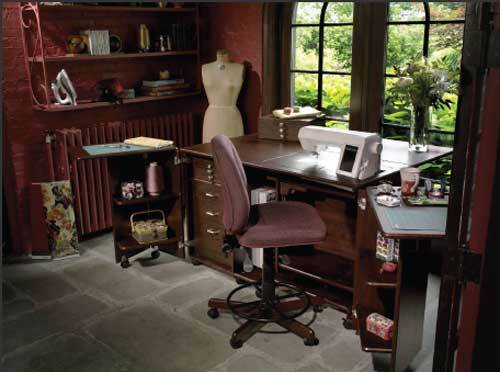 Enjoy a cutting table with over 2 square metres of workspace when open. The TreasureChest also includes an additional foot control rest and platform. A perfect companion to the TreasureChest is the StorageCenter. Built in the same height and dimension, they can be used side by side or back to back to provide a studio that is an extension of your creativity.